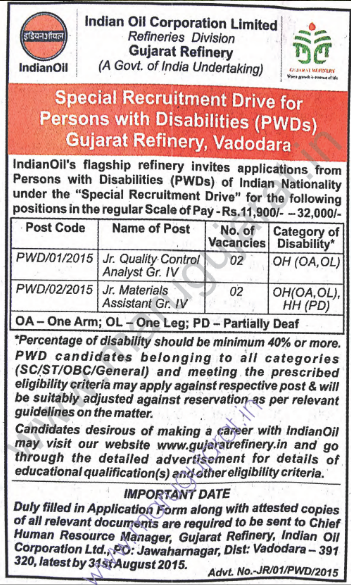 Indian Oil Corporation Ltd. (IOCL) has published a Advertisement for below mentioned Posts 2015. Check below for more details. 3 (Three) Years full time B. Sc. (Physics, Chemistry, Maths) as a regular student from a recognized university or institutions. Minimum One year of post qualification experience in handling state of the art instruments viz. HPLC, XRF, WDXRF, GC, ICAP, AAS, Auto Analysers D-86 / 1160 and Flash points etc. in Petroleum / Petrochemicals / Gas Cracker / Large Industrial units. 3 (Three) Years full Time Diploma in Mechanical OR Electrical OR Instrumentation Engineering qualification as a regular student from a recognized university or institutions. Minimum 01 (One) year post qualification experience in operation & maintenance of an industry or of handling various types of materials used in large industrial units. Knowledge of computer operation is essential. 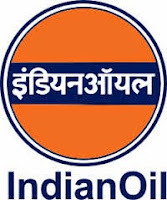 Category; 39 years for OBC Category and 41 years for SC/ST category candidates as on 31-07-2015. Age relaxation for Ex servicemen as per Government Directives issued from time to time. The candidates prima facie meeting the prescribed eligibility criteria as mentioned above with regard to qualification, age and experience requirement as per the details submitted by them in their Application Form and documents submitted along with the Application Form will undergo Written Test. Candidates shortlisted on the basis of their performance in the Written Test shall be subjected to Trade Test (wherever applicable) and Personal Interview. Candidates will have to qualify at each stage of the selection process successfully and pre-employment medical fitness for being adjudged suitable for final selection. The candidature of the applicant would be provisional and subject to verification of certificates/ testimonials, experience etc. How to Apply : Candidates should super scribe the Name of Post Applied for & Post Code, on the top of the envelope. Duly filled in Application Form along with attested copies of the following documents are required to be sent to following Address.